Get lost easy do ya? Then you'll find Garmin's new Foretrex 301 and Foretrex 401 navigators more handy on the switchbacks than a sack full of Wonder "bread." These wrist-worn GPS navigators feature a rugged, waterproof design and the ability to store up to 500 waypoints and 20 routes that'll help keep you from getting lost in the great outdoors. See, each Foretrex can remember up to 10,000 points of your journey displayed as a dotted trail on the screen. When you've reached your limits, just turn on the TracBak mode and easily double-back to camp or to your vehicle. Both devices are powered by a pair of AAA batteries for about 18-hours of use -- a bit less on the 401 which needs the extra go-juice to power the electronic compass, barometric altimeter, and wireless link back to compatible Garmin devices including heart-rate monitors and cadence sensors. Both incorporate a trip computer, sunrise/sunset and hunting and fishing information with USB tethering to PC or Mac. No word on pricing or release yet but we'll update you when we get it. Foretrex 401 and full press release after the break. OLATHE, Kan./June 16, 2009/Business Wire - Garmin International Inc., a unit of Garmin Ltd. (NASDAQ: GRMN), the global leader in satellite navigation, today announced the Foretrex 401 and Foretrex 301 GPS navigators, integrating a high-sensitivity, WAAS-enabled GPS receiver and USB interface into a lightweight, waterproof device for light hikers, skiers, campers and military personnel to wear comfortably on their wrists. 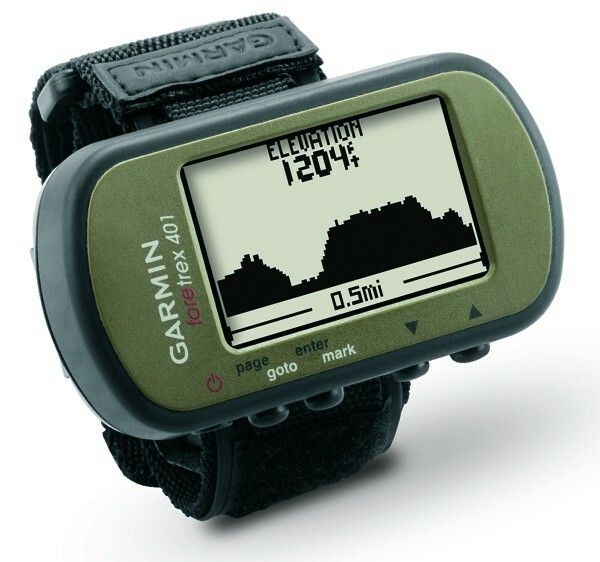 "Whether you're on a leisurely hike or in the toughest conditions imaginable, you need navigation that's simple to use and easy to access," said Dan Bartel, Garmin's vice president of worldwide sales. "Our new Foretrex models help you keep your hands free and your focus on the path ahead, all while ensuring you make it to your destination as easily as possible." Rugged and waterproof, Garmin's new Foretrex 301 and 401 models boast a high-sensitivity GPS receiver with HotFixTM that quickly acquires and maintains satellite reception – even in heavy tree cover or deep canyons – and accurately monitors and stores your routes, tracks and waypoints. When the day's activities are done, just turn on the TracBack® feature, and Foretrex will retrace your path right back to where you started. With Foretrex, you can always find your way back to any important place, like your campsite or vehicle, using the breadcrumb trail, data fields and compass screen on the easy-to-read LCD display. The new Foretrex models feature dual-position readout so that you can view your current location in multiple formats, including latitude/longitude and an alternate position format of your choice, simplifying navigation for professional, military, search-and-rescue and recreational uses. Foretrex 301 and 401 also incorporate a trip computer, sunrise/sunset and hunting and fishing information and can connect to your PC or Mac via USB connection. Adding even more features to the mix, Foretrex 401 has an electronic compass and a barometric altimeter. Foretrex 401 allows you to wirelessly share routes, tracks and waypoints between certain Foretrex, Oregon and Colorado devices, and it is also compatible with Garmin heart-rate monitors and cadence sensors. Weighing about 3 ounces and powered by 2 AAA batteries, Foretrex won't weigh you down while enduring a day's adventures with up to 18 hours of battery life in the 301 and up to 17 hours in the 401. And you can chronicle your activities by storing up to 500 waypoints, 20 routes or a tracklog of up to 10,000 points and 10 saved tracks. Foretrex 401 and Foretrex 301 are the latest breakthroughs from Garmin, which has spent 20 years using technology and innovation to enhance users' lives, making Garmin a household name in the automotive, aviation, marine, wireless, outdoor and fitness industries. For more about features, pricing and availability, as well as information about Garmin's other products and services, go to www.garmin.com, www.garmin.blogs.com and http://twitter.com/jakesjournal.